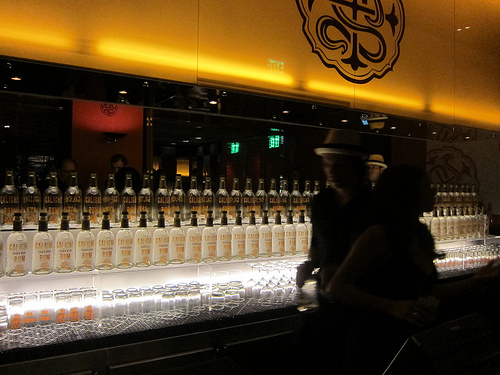 Caliche Rum Launches in L.A.
Caliche Rum from Distilleria Serralles in Ponce, Puerto Rico launched earlier this month in Los Angeles with a raucous party at the Sofitel Hotel. 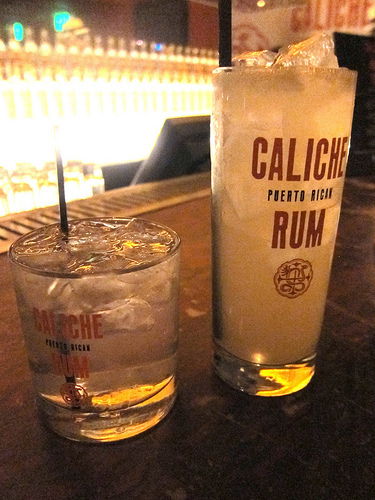 Caliche Rum is co-owned by sixth generation rum maker Roberto Serralles and Rande Gerber, husband of Cindy Crawford. The celebrity couple was in attendance along with some of LA’s most fashionable. Distilleria Serralles also makes Don Q Rum. In comparison, Don Q’s white rum didn’t have the same smoothness. 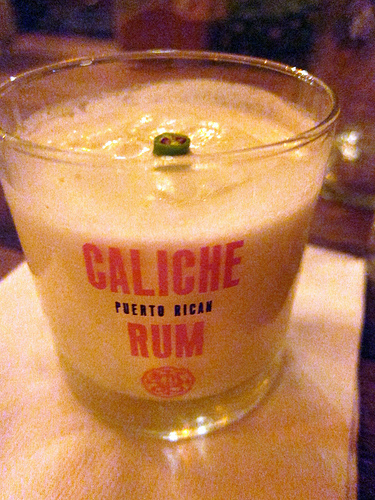 Caliche is also sweeter, keeping in line with its coconut flavor profile. It smells and taste like boozy coconut water. Gerber has said he wanted Caliche Rum to be known as a “super premium,” a title of spirits that is well-known to a nightclub operator. 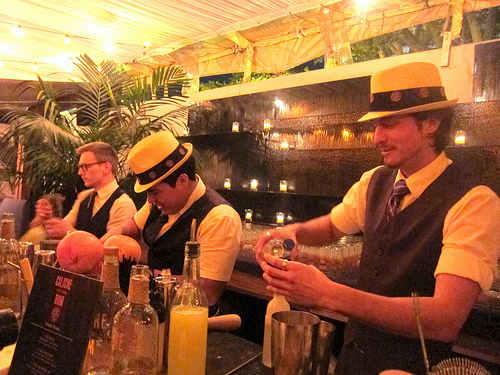 Several hundred people got to taste Caliche Rum in cocktails and shots. Party revelers were given straw fedoras and frolicked in the lounge decorated with palm fronds and the rum barrels brought in from distillery in Puerto Rico. And it’s not a party unless there is a photo booth. Michel Dozois, owner of Neve Ice, was on hand with a team of bartenders. He created the cocktails at the main bar to be simple 2 or 3-ingredient cocktails to introduce you to Caliche such as the Cali Libre (Caliche rum and Coke). We also tried the Cali Coco (Caliche rum, coconut rum, coconut water, simple syrup) and Cali Ginger (Caliche rum, ginger beer, agave). 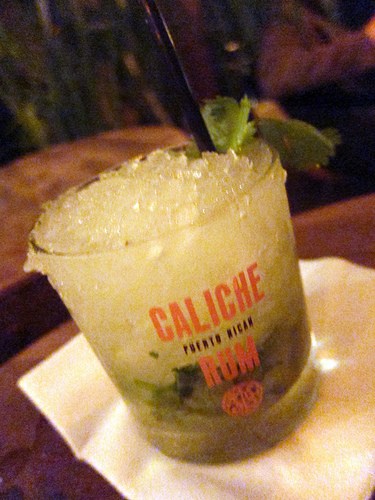 The other available cocktail at the front bar was the Cali Mojito (Caliche rum, lime, mint, simple syrup). At the back bar where he was at, a booze nerd could pay respects to his Cali Kick (Caliche rum, Thai chili, lemon juice, cream) or Cali Gold (Caliche rum, cilantro, pineapple, simple syrup). 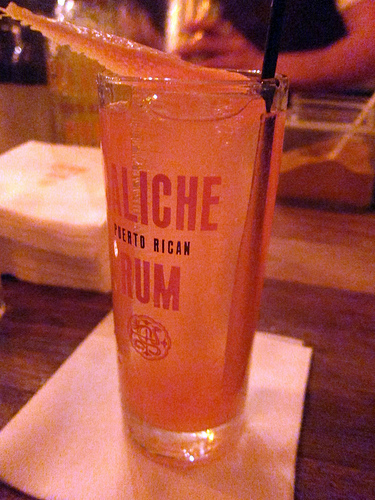 I also enjoyed the Cali Grapefruit (Caliche rum, Campari, grapefruit, simple syrup, soda). 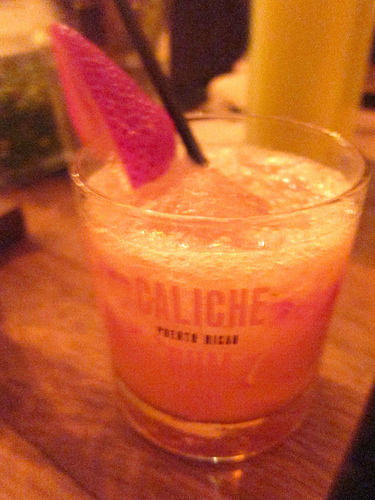 The Cali Daiquiri (Caliche rum, fresh strawberry, fresh lime, simple syrup) developed a cult following that evening. This entry was posted in alcohol education, alcohol tasting, bartenders, cocktails, events, hot bartenders, la, la cocktails, los angeles, spirits, the minty and tagged booze education, caliche rum, cocktailian, cocktails, craft cocktailis, event, highballs, hot bartenders, launch, michel dozois, neve ice, new booze, party, puerto rico, rum. Bookmark the permalink.